The Care Ecosystem model was designed to help address the unmet needs of persons with dementia and their caregivers. What is the Care Ecosystem? The Care Ecosystem is a model of dementia care designed to provide personalized, cost-efficient care for persons with dementia (PWD) and their caregivers. This telephone and web-based intervention was developed and studied across California, Nebraska and Iowa via an award from the Center for Medicare and Medicaid Innovation (CMMI grant number 1C1CMS331346) from 2014–2018 and continues to be studied with funding from the National Institute for Health (NIH grant number RO1 AG056715) from 2018–2022. The CTN is the main point of contact for patients and caregivers in the Care Ecosystem. They are unlicensed yet trained to screen for dementia-related needs and provide support and information. Their work is guided by care protocols and they are supported and supervised by a clinician (nurse or social worker). Who is the Care Ecosystem for? The Care Ecosystem was designed to enable health systems and clinics to provide dementia-capable care to the growing population affected by dementia and their caregivers. This toolkit provides an overview of the Care Ecosystem model and how to implement it in your institution. How Can the Care Ecosystem Toolkit be Used? The Care Ecosystem Toolkit was developed using public funds and is available free of charge with attribution to the Regents of the University of California. This work is licensed under the Creative Commons Attribution 4.0 International License. To view a copy of this license, visit creativecommons.org/licenses/by/4.0 or send a letter to Creative Commons, PO Box 1866, Mountain View, CA 94042, USA. The Care Ecosystem was first implemented at the University of California, San Francisco (UCSF) Memory and Aging Center’s research unit and the University of Nebraska Medical Center (UNMC) as part of a randomized controlled trial, which together enrolled 780 person-with-dementia-caregiver dyads. This trial is ongoing and serves participants located throughout the states of California, Nebraska and Iowa. The care model and early findings are described here, and results based on one year of enrollment will soon be published. For the trial, the Care Ecosystem is provided from the two hubs to dyads located throughout the states of California, Nebraska and Iowa and in English, Spanish and Cantonese. In the subsequent implementation projects, described below, care is integrated with a clinic already involved in each dyad’s care. In the trial and in all the subsequent implementations described below, the relationship between a Care Team Navigator (CTN) and the dyad is at the center of the intervention. The CTN responds to dyads’ needs and reaches out proactively to work with them on caregiver support and education; medications; planning ahead for medical, financial, and legal decisions; and managing behaviors. The focus of the care is always tailored to the needs of each dyad. Issues that exceed the CTN’s scope are triages to the specialist team. The Memory and Aging Center Clinic provides specialized in-person diagnostic evaluations and treatment recommendations for common and rare types of neurodegenerative diseases. With funding from the Administration for Community Living (ACL), a Care Team Navigator (CTN) who is trained to implement the Care Ecosystem, is integrated with the MAC’s multidisciplinary clinical team (neurologists, social workers, and nurses) to deliver telephone-based support, education, care planning and coordination. Clinic providers and staff refer patient and caregiver dyads with high needs to the CTN for an extra layer of support and follow-up. The CTN works with patients across all stages of dementia living throughout the state of California and receive neurology specialty care at this clinic. In this fee-for-service behavioral neurology specialty clinic, we are working to implement the new Medicare billing code for Cognitive Evaluation and Care Planning (CECP) visits to increase access to care and to help offset program costs. Our plan is to shift semi-annual follow-up visits for patients with a clear diagnosis to advanced practice nurses who will complete annual CECP visits with the patient, caregiver and CTN using information collected prior to the visit by the CTN. The Curry Senior Center is a safety-net clinic dedicated to providing healthcare to marginalized low-income and homeless seniors in the Tenderloin neighborhood of San Francisco. Most patients are socially isolated and do not have informal caregivers, and many have limited English proficiency. Curry provides comprehensive primary care services on site, in addition to home visits for patients with limited mobility. Case management and behavioral health services for support with smoking cessation, substance abuse and mental health are also available. With funding from the Administration for Community Living (ACL), a Care Team Navigator (CTN) who is trained to implement the Care Ecosystem is integrated with Curry’s multidisciplinary team onsite to deliver care. Providers refer patients to the CTN for administration of dementia risk screens (measuring cognition, depression, function, safety, advance care planning, and unmet needs). 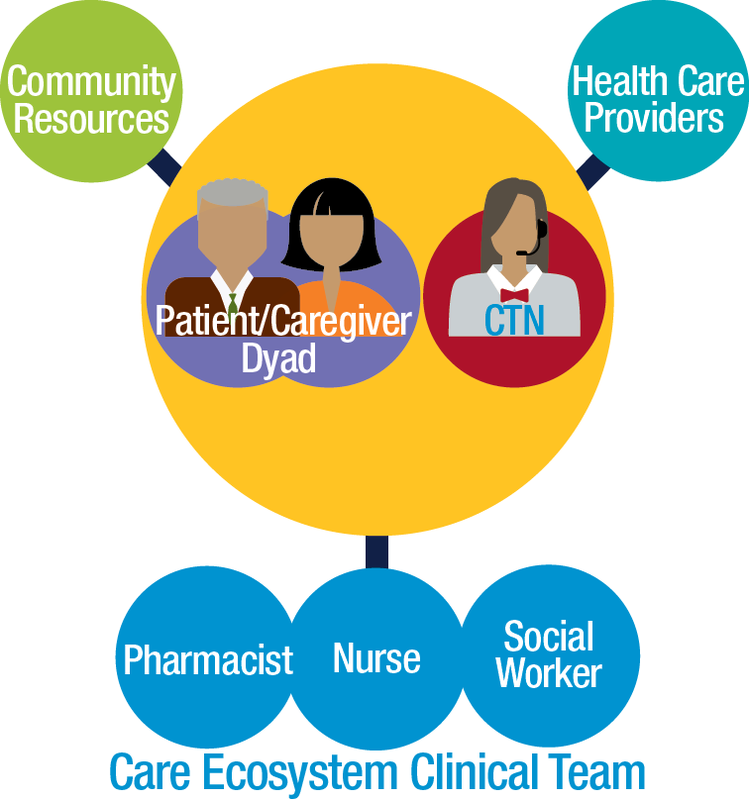 The CTN then works with patients, their providers, and others involved in the patient’s care to address identified issues and connect patients with local community resources. The CTN at Curry typically serves patients with mild cognitive impairment to early stage dementia and often acts as a bridge to more intense case management services. As a Federally Qualified Health Center (FQHC), Curry is not able to use the new Medicare billing code for Cognitive Evaluation and Care Planning visits. Instead, we plan to use the Medicare Annual Wellness Visit as the initiating visit for Complex Chronic Care Management that will be provided by the CTN under the supervision of an advanced practice nurse who will bill for the monthly service. The HealthPartners Center for Memory and Aging (HP-CMA) is a specialized clinic based in Saint Paul, Minnesota serving patients with dementia and their families. HP-CMA is part of the nonprofit HealthPartners managed care health system based in Bloomington, Minnesota. Their clinical services include a multidisciplinary team of neurologists, neuropsychologists, nursing staff and social workers providing in-person diagnostic evaluations and treatment recommendations for Alzheimer’s disease and associated disorders. Care consultant specialists provide personalized disease education and referrals to community services for additional information and support. HealthPartners was recently awarded a 4-year grant from the Merck Foundation to implement the Care Ecosystem as a way to improve access to follow-up care and support for underserved rural-dwelling patients with dementia and their families. Two Care Team Navigators (CTNs) will be integrated with HealthPartners’ multidisciplinary team onsite to deliver longitudinal care throughout the continuum of dementia. The CTN will work with the clinical team to address needs identified by the patient and caregiver. Providers will specifically refer high-needs patient and caregiver dyads to the CTN for an additional layer of care support. The CTN will provide ongoing support, education, and monitoring over the phone and refer patients and caregivers to community supportive services. HealthPartners will evaluate whether the Care Ecosystem improves patient experience, clinic access for new patient visits, reduces transitions to residential care, and decreases caregiver burden. In addition, HP-CMA will be examining ways to keep this program sustainable by implementing new billing codes for dementia care. The UCHealth Seniors Clinic, located in the Denver, Colorado metro area, provides primary health care for patients aged 75 years and older. Seniors Clinic providers and staff work to promote wellness for older adults and to improve the diagnosis and treatment of age-related diseases and syndromes, allowing for optimal care of the older adult patient. With funding from the Centers for Medicare and Medicaid Services Comprehensive Primary Care+ program, the Seniors Clinic plans to incorporate the Care Ecosystem program beginning in September 2018, with a Care Team Navigator (CTN) embedded directly in the clinic. Patients and their caregivers will be referred directly to the CTN for support by the patient’s primary care provider. The CTN will conduct an initial in-home needs assessment and refer patient-caregiver dyads to local community services as appropriate. The CTN will work closely with providers and the rest of the interdisciplinary team at the clinic to address complex needs and issues, to improve follow-up care for patients with dementia and their caregivers. The Ochsner Brain Health and Cognitive Disorders program is a specialty clinic within the Neurosciences Department at the Ochsner Medical Center in New Orleans, Louisiana. They provide specialized and comprehensive care regionally and nationally for those with cognitive disorders such as Alzheimer’s disease and other dementias. Diagnostic services offered can include a neurological evaluation, neuropsychological testing, labs, imaging and other diagnostic tests. This comprehensive and detailed approach allows for better answers and more tailored treatment recommendations. Ochsner recently received funding from a private donor to kick off the Care Ecosystem program. The Brain Health and Cognitive Disorders Program is set to adopt the Care Ecosystem in January 2019, with two Care Team Navigators (CTN), a part-time nurse practitioner and part-time pharmacist to carry out the study. The Care Ecosystem will be integrated with Ochsner’s multidisciplinary team onsite to deliver care, while also utilizing telehealth to digitize and simplify getting care to the patient and caregiver. Providers refer patients to the CTN for administration of dementia risk screens (measuring cognition, depression, function, safety, advance care planning and unmet needs). The CTN then works with patients, their providers and others involved in the patient’s care to address identified issues and connect patients with local community resources. After the first in-person visit, much of the care can be delivered online to provide families with accessible, fast information from the CTN or medical professionals. Ochsner will focus on stratifying high utilizers of the medical system that have capitated payments to participate, highlighting the savings a program like this could have.